During my last two recent visits to the place, I noticed there were quite a number of this species ranging in a grassy area at Sto. Tomas (La Union). 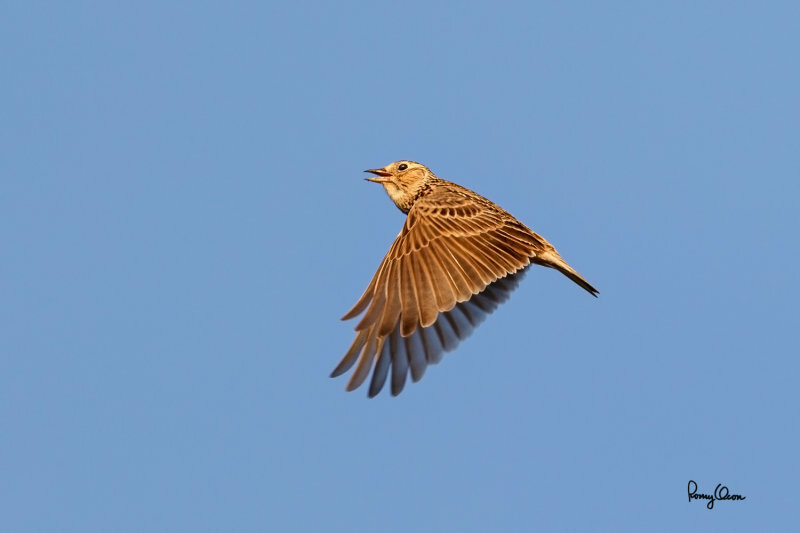 In the late afternoon, a few individuals do their courtship flight - partially hovering and ascending to as high as 25 to 30 meters while singing. Most of the previous courtship flights I saw were either at a great distance, or the direction of light was unfavorable. This Sunday afternoon, I returned to the area to check out the Sand Martins and the Eurasian Hobby. My two birds of interest were a no-show, but one Oriental Skylark did its courtship flight at a relatively near distance. And it did this spectacular show while illuminated by the golden light of the 4:33 pm sun. It was a pure luck that I got to see this behavior up close. I'm glad that my manual exposure settings were on the dot and the BIF gear did its AF job well. Habitat - Uncommon in open country on the ground. 400 mm, f/4.5, 1/2000 sec, ISO 320, manual exposure in available light, hand held, major crop resized to 800 x 533.